I’ll never forget playing “Tangerine Poker,” a card game my niece Julie and I made up as we went along: I would pick a card, and put the tangerine next to the salt shaker. Julie would put a card on top of mine, and peel the tangerine. My mother would study her hand carefully, look down at the table, and eat the tangerine. I first noticed that my mother’s mind was beginning to lose its way 12 years ago: midway through a sentence, her intended communication would get derailed and head off in a different, illogical direction, her original thought misplaced forever. Then we found a missing brisket in her pocketbook, and soon after, she got lost in our neighborhood of 55 years. One morning she had no recollection of her 60th Anniversary party the night before, where she had been a seemingly normal, social butterfly, warmly greeting and chatting with everyone. My Mom is a Holocaust refugee; she arrived in this country at the age of 14 with her immediate family. Although her beloved grandmother had lived with them for years, they were unable to obtain a visa for her, and Grandma insisted they get out while they could. She was taken away soon after on a cattle car to a labor camp where she perished a few months later. There are many stories from that time, none of them pleasant, but just to say, yes, my mother grew happier without her memories. 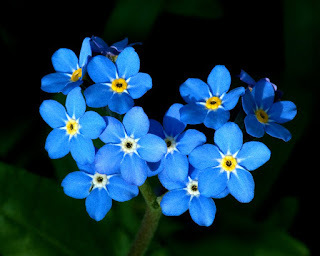 I have felt thankful for Alzheimer’s on many occasions. Not only for the positive changes I saw in her—albeit, not on a cognitive level—but also the changes I saw in me, and in our relationship. From my comfortable distance of not being the daily, hands-on caregiver like my overtired and stressed-out Dad, I observed layer upon layer of fear and anger and tension gradually drop away from my mother, eventually freeing her spirit to return to a simple, childlike, loving and happy innocence, smiling and laughing throughout the day. I was actually a bit jealous. She often appeared to be blissed out, and seemed to find nearly everything hilarious. Even lying on a gurney in the hospital, when I said, “You’re getting an endoscopy,” she cracked up, thinking it to be the funniest thing she’d ever heard. After a lifetime of struggling in my relationship with her, she became so irresistibly sweet and loving that the past disappeared and I began to feel and share my love for my mother in a way I hadn’t experienced since early childhood. We sang together, and played piano, with her repeating a single note in perfect rhythm as I improvised over it. We physically touched more than we had in 40 years. Friends often ask me, with a pained expression on their face, “Does your mother still know who you are?” Inwardly I always think, “I don’t even know who I am, why would I care if she doesn’t?” And it's true. Even though she may not know my name or that I am her son, I have never felt our fundamental sense of connection go away, and it became obvious to me over time that that is all I truly care about. When I walk into the room and her face lights up with a big smile, it is enough for me. Of course, she doesn't know I have simply been in the kitchen, and not absent for months. For her, my return from the kitchen is a new moment, a joyful reunion, and we have many of these each day. “You’re kidding!” she said, amazed at the coincidence. It finally dawned on me that she was describing her moment-to-moment experience of what was appearing on the television screen, commercials and all. A striking example of my mother’s transformation occurred one evening when our family went out to dinner, and afterward, as my father, brother and I were exiting the restaurant, we suddenly realized Mom wasn’t with us. We peered in through the plate-glass window, and watched, astonished, as she stopped at each table to strike up a conversation with virtually every diner in the place! She had always been very reserved and formal around “strangers,” which pretty much included everyone outside of our family, and certainly everyone that wasn’t Jewish. This was a brand new Mom, and I loved her! I envied her. I wished I was as unreserved and fearless, and I found myself wishing I had grown up with this version of her: free, unafraid, friendly, happy. But I was at least grateful to see this side of her now. It seemed as if her essential childhood self was at last shining through, allowing her to fully be who she might have been…without her memories. Putting music on and watching my parents dance in the living room for the first time in years. Seeing her be delighted by a Dean Martin DVD even after the 1000th time, and still seeming to laugh at all the right places during I Love Lucy. As her ability to speak English began to fade and ultimately disappear, my mother substituted a nonsense gibberish language all her own, yet continued to be quite alert and engaging. We enjoyed long, incomprehensible conversations that rivaled Lewis Carroll’s Jabberwocky. Meanwhile, my Dad, a former mathematics professor and rather linear thinker, looked on, perplexed, trying to figure out the rules! When I’m visiting now, I join in the nightly ritual of bringing her upstairs to the bedroom, along with my father and an aide, and I watch their routine of sitting on the edge of the bed for a few minutes, then kissing goodnight, on the lips. My Dad, too, after 12 hard years, has finally learned to treasure each of those little moments of connection, the little joys that are the hidden blessings of Alzheimer’s disease. 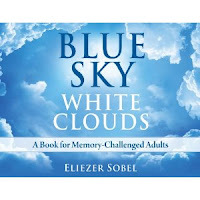 Eliezer Sobel is the author of Blue Sky, White Clouds: A Book for Memory-Challenged Adults.